One of the perennial favorite recipes from River Road Recipes I: A Textbook of Louisiana Cuisine, of course, is the Spinach Madeleine. A time-honored culinary tradition no longer limited to just the Baton Rouge area, it may well be that no single recipe has ever reached such national acclaim as our own beloved Spinach Madeleine. In celebration of the 80th reprint of River Road Recipes I coinciding with the 85th birthday of the Junior League of Baton Rouge, local newspaper The Advocate published an article interviewing Madeline Nevell Reymond Wright, the creator of the recipe. Check out the original article featuring Ms. Spinach Madeleine, herself, here! Advocate Staff Photo by Pam Bordelon. 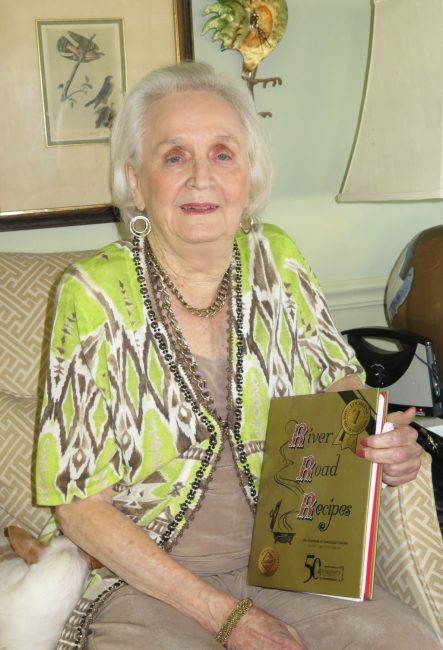 The creator of the Spinach Madeleine recipe, Madeline Nevell Reymond Wright, poses with the 50th anniversary edition of River Road Recipes I. We know by now you probably know a LOT about River Road Recipes. You know we are not only the oldest community cookbook currently in print in the entire United States, but we are also the all-time #1 best-selling community cookbook in the nation! You probably know our first and most famous cookbook, River Road Recipes I: A Textbook of Louisiana Cuisine, was first published in 1959, and, against all odds, has sold over 1.4 million copies and is currently on its 80th reprint! You know that over time, we have added three more cookbooks to our collection: River Road Recipes II: A Second Helping, River Road Recipes III: A Healthy Collection, and River Road Recipes IV: Warm Welcomes. You know that together, sales from our four cookbooks have generated over $3,000,000 to fund various projects in the Greater Baton Rouge Area, from the Baton Rouge Hearing and Speech Foundation (now The Emerge Center) to our partnership with Our Lady of the Lake Children’s Hospital, to countless others. The 2016-2017 River Road Recipes Committee. Back row, left to right, Briana Bramlette-Sikes, Lauren De Witt, Emily Scofield, Sandy Lynch, Catherine Coxe, and Amy Vickers; middle row, left to right: Michelle Bickham, Rebecca Klar, Stephanie Heroman, Jennifer Lear, Jessica McVea, Adrien Busekist, Georgia Shirley, Betsy Buchert, and Cheryl Payne; front row, left to right, Lisa O’Beirne Ryan, Jennifer Henry, Allison Reeves, Leacy Aycock, Kimberly Wood, and Kimberly Brewster. What you may not have considered, however, is that this amazing legacy would not have been possible without the effective action and leadership of the women of the Junior League of Baton Rouge, and particularly, the ladies who have served on the River Road Recipes Committee since the original committee was formed in 1957. With Placement* for the 2017-2018 League year quickly approaching in April, we wanted to take the time to recognize the ladies of the 2016-2017 River Road Recipes Committee and encourage you to be a part of our committee in the upcoming League year! * For non-JLBR members, “Placement” is the time of year, typically in April, when members choose the roles (i.e., community projects, fundraising, in-League) they will serve in for the upcoming League year. You can check out all of our current Community Projects here and check out our various Fundraisers here. In addition to Community Projects and Fundraisers, there are also many “in-League” placements that ensure the League as a whole continues to run smoothly so that we can have the most effective impact in our community. The River Road Recipes Committee consists of 20 women who together dedicate over 190 hours each month to promoting, marketing, selling, and distributing the River Road Recipes Cookbook Collection. The River Road Recipe Committee consists of various sub-committees, including the Steering Committee, the Sales and Distribution Committee, and the Marketing and Events Community. 2016-2017 River Road Recipes Steering Committee. 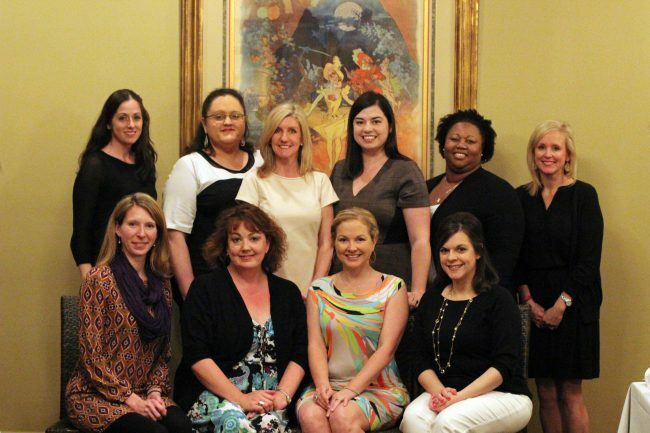 Back row, left to right: Michelle Bickham, Catherine Coxe, Lauren De Witt, Rebecca Klar, Amy Vickers, Cheryl Payne; front row, left to right: Jennifer Henry, Jennifer Lear, Jessica McVea, Betsy Buchert, Georgia Shirley, Kimberly Brewster. Our steering committee consists of our Chairman, Jessica McVea, our Treasurer, Jennifer Lear, our Marketing Events Chairman, Kimberly Brewster, and her two assistant chairmen, Jennifer Henry and Rebecca Klar, our Sales and Distribution Chairman, Michelle Bickham, and her assistant chairman, Betsy Buchert, our Sustaining Adviser, Cheryl Payne, our Editor and Data Coordinator, Jennifer Bounds, and our Blog Administrator, Lauren De Witt. Members of the Steering Committee meet monthly, and many of us sit on a variety of other committees within the League, including the Membership Council, the Marketing and Communications Council, the Fund Development Council, and the Financial Council. Being a member of the Steering Committee is a great way to get involved in League leadership positions. It also provides opportunities to learn more about the internal organization of the League and involves interaction with women across all areas of League service. 2016-2017 River Road Recipes Sales & Distribution Committee. Back row, left to right, Briana Bramlette-Sikes, Emily Scofield, Catherine Coxe, Betsy Buchert; front row, left to right: Sandy Lynch, Michelle Bickham, and Stephanie Heroman. Our Sales and Distribution Committee is responsible for overseeing our inventory, bookkeeping, purchaser orders, and printing, just to name a few! These ladies are extremely organized and work hard to ensure we are able to continue meeting the demand for our cookbooks not just locally, but nationally. 2016-2017 River Road Recipes Marketing and Events Committee. Back row, left to right: Adrien Busekist, Rebecca Klar, Kimberly Brewster, and Kimberly Wood; front row, left to right: Jennifer Henry, Allison Reeves, Leacy Aycock, and Lisa O’Beirne Ryan. Finally, our Marketing and Events Committee is where all the fun event planning happens. 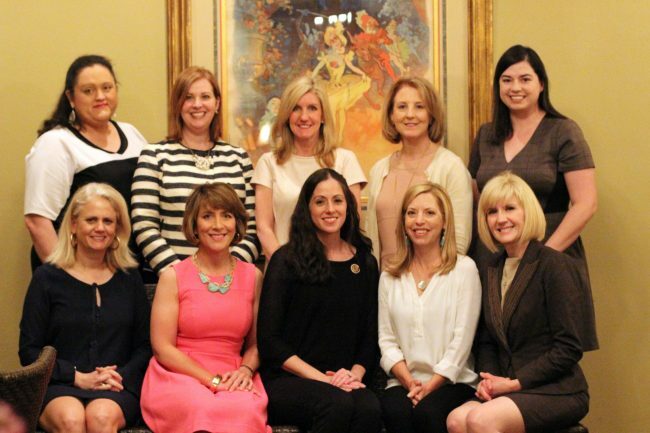 These are the ladies who plan our events like our annual Past Chairman’s Luncheon, our upcoming Tin Roof Beer Dinner at Galatoire’s Bistro, and our various Red Stick Farmers’ Market appearances throughout the year. They are the face of River Roads Recipes to the community as they also oversee our media relations, including TV, magazines, radio, and newspaper. Just like in the rest of the Junior League, some of us are wives and mothers. Some of us work full time outside the home, while others work full time in the home. Some of us love cooking, and some of us just love to eat the samples (I mean really, who can resist Fool’s Toffee?). What we all have in common, however, is that we all love being a part of this amazing legacy! Spinach Madeline, RRR I. Photo by Don Kadair. Sparkling Cranberry Punch, RRR I. Photo by Don Kadair. Curried Chicken Salad, RRR III. Photo by Lauren De Witt. Looking for a new experience in the League? Want to be an integral part of a League tradition and living piece of local history? Interested in developing a wide variety of skills and helping fund the League mission? Consider joining the River Road Recipes Committee for the upcoming League year! Pre-placed positions for the River Road Recipes Committee occur in September, so be sure to update your interest indicator in Digital Cheetah if you are interested in serving as Chairman, Treasurer, Marketing and Events Chairman, or Sales and Distribution Chairman. Members of the River Road Recipes Committee will also be on hand at the upcoming Volunteer Fair in April to answer any questions you might have about being a part of this amazing Committee! Not a Junior League member, but still want to be involved? You can help support River Road Recipes and the amazing work the Junior League of Baton Rouge does in our community by purchasing a cookbook here or making a donation to the Junior League of Baton Rouge here. Mark your calendars! 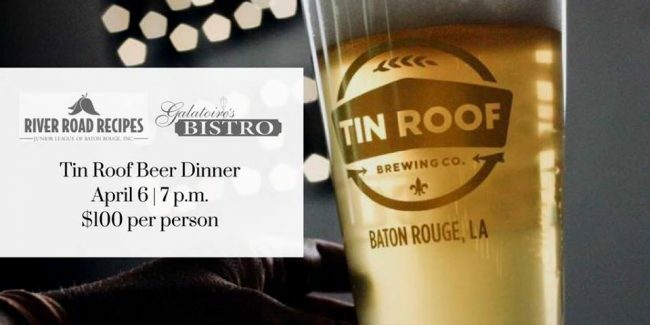 River Road Recipes of Junior League Baton Rouge, Galatoire’s Bistro, and Tin Roof Brewery are proud to present our first ever Tin Roof Beer Dinner! THE DEETS: Join the ladies of the Junior League of Baton Rouge for the perfect date night or girl’s night. Tickets are $100 per person and come with a complimentary copy of River Road Recipes IV: Warm Welcomes. You’ll enjoy an evening of fabulous brews handcrafted right here in Baton Rouge by Tin Roof Brewery and a delicious four course meal featuring recipes from River Road Recipes IV: Warm Welcomes! The best part? It’s all for a great cause. ICYMI: River Road Recipes I Featured in inRegister Magazine! Photo by Melissa Oivanki, inRegister March 2017 issue. So, cheers to you, our old-guard original! You’ve never looked better. Be sure to check out the original article in inRegister here and sign up to receive your monthly edition of inRegister to stay au courant about all the very best of Baton Rouge! Since the River Road Recipe cookbook collection began in 1959, combined sales of our four beloved cookbooks have earned more than $3,000,000 to fund League projects in the Baton Rouge community! This is truly an amazing legacy. This feat would not have been possible, however, without the “effective action and leadership” of our volunteers, in particular, the past Chairwomen of the River Road Recipes Committee. Friday, March 10, we celebrate our past River Road Recipes Committee Chairwomen with a luncheon at Galatoire’s Bistro from 12-3 pm. We look forward to honoring these innovative and dedicated women and their collective leadership over the past 58 years. From the bottom of our hearts and the hearts of the hundreds of thousands in our community who have been positively impacted by League projects, thank you! 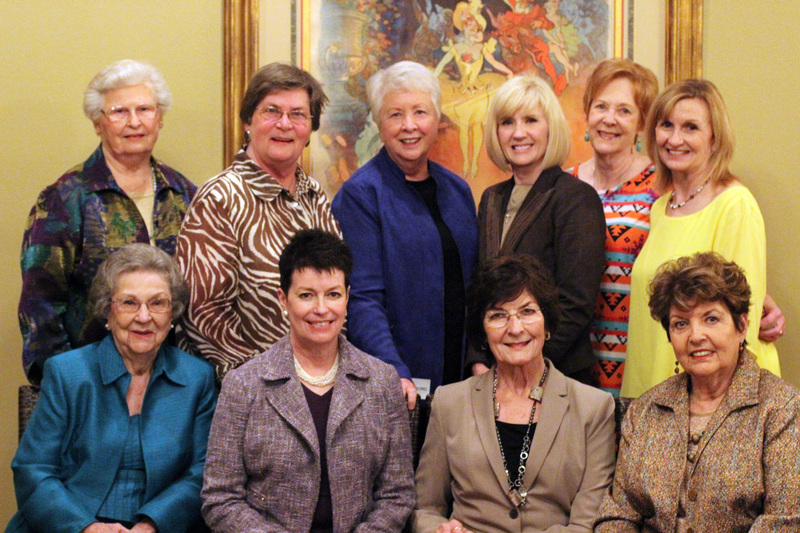 Past Chairwomen at the 2014-2015 Luncheon at Juban’s.